Your article about the new Phoenix mascot (“Swarthmore Hatches a Big Red Bird,” July Bulletin) made me nostalgic for the now defunct Swarthmore Marching Society of my college days. Ah, now there was a source of spirit, hilarity, and pride! It may not have been the only such college organization to put “spin” on the half-time show, but tears come to my eyes at the thought of “The sperm fertilizes the egg” as performed on Swarthmore’s field during the intermission of a football game. Can you tell the story so it’s not lost to today’s spiritmongers? The Bulletin welcomes alumni accounts or photos of the exploits of the Swarthmore Marching Society. 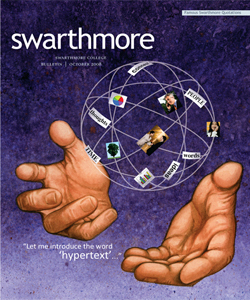 Write to us at: Swarthmore College, Swarthmore College Bulletin, 500 College Avenue, Swarthmore, PA 19081 or e-mail bulletin.swarthmore.edu.